NEW YORK, New York, June 29, 2010 (ENS) – A federal judge Monday dismissed a lawsuit brought by electronics companies against New York City’s new e-waste recycling initiative. Panasonic, LG Electronics, Sony and Samsung sued the city arguing that the new recycling law could end up costing them as much as $200 million a year to comply with the recycling initiative even if they only had minimal presence in the city. But a new stronger statewide law passed May 29 preempted the New York City electronics recycling law, which the judge ruled made the lawsuit against the city moot. The statewide law holds electronics manufacturers liable for the costs of collecting and recycling electronic waste. 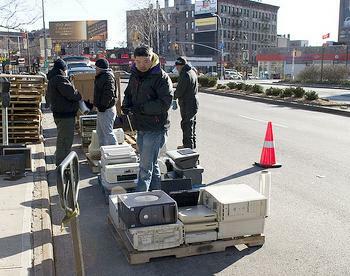 The parties in the case had been holding negotiations on plans to collect and recycle the city’s e-waste. Both sides said talks will continue now that the suit has been dismissed. The city e-waste recycling initiative became law in 2008 and was scheduled to take effect in the second half of 2009 when the electronics companies requested an injunction. The new state law will go into effect in April 2011. The new state law requires manufacturers to pay $5,000 to register with the program, and an additional $3,000 each year in reporting fees to report to the state how much material they have recycled. The bill allows manufacturers to charge a fee to businesses with more than 50 employees or nonprofit organizations with more than 75 on staff. Manufacturers will be required to meet collection goals and provide convenient collection. The industry also has been fighting similar attempts by other states to require electronics recycling. The Electronics Takeback Coalition has created a map outlining electronic recycling laws in a total of 23 states that now have e-waste laws. “Here we had many electronics companies who had very clear public statements in support of producer takeback and producer takeback laws, yet they were hiding behind their industry associations that were calling these laws ‘unconstitutional,’ said Barbara Kyle, national coordinator of the Electronics TakeBack Coalition. “This was a very bad PR position for these companies to be in, and it made them want to settle this case, and made it easier to pass the legislation at the state level,” she said. Under the New York State law, all manufacturers that sell electronic equipment in the state must have a free, convenient electronic waste recycling program in place by April 1, 2011. The law covers televisions, computer monitors, computers, keyboards, mice, printers and cables. It gives manufacturers latitude to create collection programs that fit their specific business model so long as they collect the statutory minimum amount of waste each year. The new law also makes it illegal for individuals to dispose of electronic waste at landfills, effective January 1, 2015. According to the U.S. Environmental Protection Agency, e-waste contributes 70 percent of the toxics but just one percent of the volume of materials found in landfills. Toxic materials in e-waste include lead, mercury, cadmium, phosphorus and flame-retardants. Recycling e-waste decreases energy and water use, reduces pollution, and keeps hazardous chemicals out of air and water.